Out of respect for this season’s couleur de la saison this week’s menu is dedicated to Orange and its compliment of associated rich shades and warm hues. 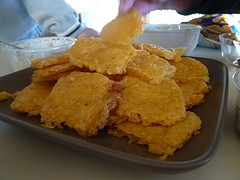 The cheese wafers, while not necessarily served at the dinner table are by all means a starter for the night’s feast. You can use whatever cheese you favour, but the sharp cheddar is the classic choice and fares well with this mix and method of baking. The water content of cheese plays a part in their resilience to cooking. Too much water and it does not hold up as well, melts downs and does not always brown. Too little water and the end result becomes a crumbling mess. Should this happen, don’t despair and throw them out! Find something else to serve with wine before diner and save the crumbs for an ingredient in another recipe in the near future, such as replacing some of the breadcrumbs mixed into a meatloaf recipe with these tasty cheese crumbs! 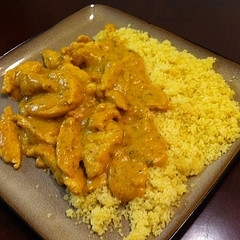 This creamy curried chicken recipe is one handed down to me by the chef of a popular bistro many years ago. The bistro is gone but the recipe survives! You can actually dial up the level of curry in this recipe (reasonably) because with the addition of banana and apple the fiery bite to the curry is reduced considerably. If you wish, you can even add some diced up mango to add an addition level of flavour to the mix. 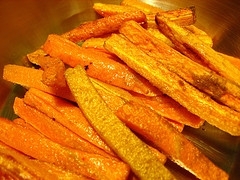 And, what can I say about carrot fries? Long before McCain’s discovered oven-fried fries then sweet potato fries I have been making these delicious, crispy tubers. Served as a novel vegetable treat it adds not only texture to a saucy meal but is actually really healthy. When baked in vegetable or olive oil in the oven they are infinitely healthier than deep-fried and a lot less messy. Next time you look at dried apricots and think they can only satisfy your munchies need, you find out that you’ve been wrong. Who woulda thunk you could soak the little buggers, purée them and create a unique fruit compote that only needs a dollop of mildly sweetened whipped cream to complete this colour dedicated menu? So, hats off to Orange and its family! With Golden Cheese Wafers, Creamy Curried Chicken, Crisply Browned Carrots and yellowish-orangeish Apricot Compote we’ve pushed the envelope just a bit, just don’t do this sort of combination too often lest you turn orange from Carotenaemia! Preheat oven to 350ºF (175ºC). Line a baking sheet with parchment paper or spray with cooking spray. Combine butter and cheese with a fork in a mixing bowl until well blended. Blend in flour and cayenne. Roll mixture into 1 inch (2.5 cm) balls. Place balls prepared baking sheet and flatten with the heel of your hand until approximately ¼” (.635 cm) thick. Bake for 12 – 15 minutes or until golden brown and crispy. Melt butter in large skillet. When melted, add flour, stir until all butter is absorbed. Add more flour if necessary. Allow to come to boil but don’t allow to brown. Gradually whisk in milk, stirring constantly to avoid lumps. Heat on medium-high, allow to come to boil stirring constantly as sauce thickens, this will eliminate starchy taste. Reduce heat to low. Add mashed banana and apple. In separate skillet, cook chicken in oil, just until whitened (no longer pink). Remove from skillet. Add onions and garlic. Cook until onions are softened, not brown. Remove from skillet with slotted spoon. Add chicken, onions and garlic to sauce skillet. Add curry powder, Maggi and pepper to taste. Serve on basmati rice (cooked in chicken stock with a pinch of saffron and turmeric for colour). Serve with Naan bread if desired. prevent thinning out the sauce. Add sweet pickled onions at the last moment. These are simply a variation of the ever popular French fried potatoes just using carrots instead. The addition of a small amount of sugar guarantees a divine crispy texture of the finished dish. Preheat oven to 425ºF (218ºC). Line a baking sheet with parchment paper or foil. Use a sharp knife. Remove the tips of the carrots (unless they are the stubby-ended variety). Cut carrots in half lengthwise, cut the halves in half lengthwise then cut each of those in half lengthwise. Put all the ingredients besides the carrots in a large bowl. Stir to blend well. Add the carrots and, using gloves, mix to thoroughly coat carrots on all sides. Place carrots on prepared pan, spreading out as well as possible. Bake for ± 20 minutes or until crisp on the outside and tender on the inside. Serve with a brown mustard and mayonnaise mix dipping sauce. Place apricots and water in a saucepan. Bring to a boil and cook over medium/low heat for 30 minutes. Purée the soaked apricots with the water then return to saucepan and stir in almonds. Cook until mixture begins to thicken. Stir in sugar and almond extract and cook for a few minutes. Scoop into individual serving cups and refrigerate. 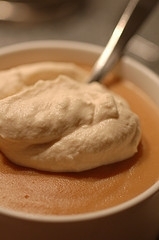 Just before serving, whip cream with pinch of sugar until soft-firm peaks form. Scoop a dollop of whipped cream on each serving.